Hand-crafted by specialist silversmiths in Galicia, northern Spain, this sweet little sterling-silver and enamel Angelito bears a tiny scallop shell of the Camino de Santiago. The combination of the little Guardian Angel and the Concha de Vieira shell is indicative of both protection and guidance: As a gift to a friend or loved-one, the Angel symbolises a wish to have someone watch over them: The little scallop shell symbolises a journey: And, on the back of this unique and inspiring piece of jewellery, is an engraved Tau Cross of St Francis - the symbol of pilgrims, or people "on a mission" or a journey. In Spain, some 150,000 people travel to Santiago de Compostela every year from all over the world to find inspiration and/or deeper spiritual understanding. 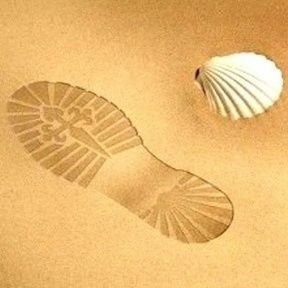 Many carry with them a scallop shell of the Way of St James, a Tau cross, or some other symbol of personal significance like the St James Cross. This necklace (hand-crafted in A Coruña, Galicia, northern Spain) has similar significance. 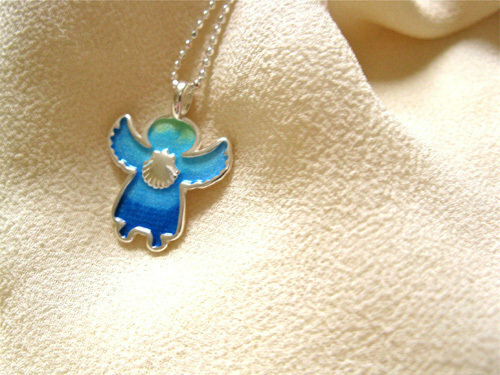 Description: The little angel (or angelito in Spanish) is made of sterling silver coated with enamel and measures 23mm in length including the hanging bail. There is a tiny sterling silver scallop shell on the front of the angel and the Tau Cross engraved on the back, symbolic of a journey or pilgrimage. It hangs on an 18" sterling silver diamond cut ball chain which sparkles beautifully in the light. A 20" length is also available: Please choose from the Options box when ordering. Various colours available: Please choose in Options box. This sweet angelito necklace with its tiny scallop shell and Tau cross, really IS a piece of jewellery with meaning, and is the perfect present to wish someone a 'buen camino' / safe journey . Comes gift-wrapped, like all our presents - and we can print a personal message on your behalf.